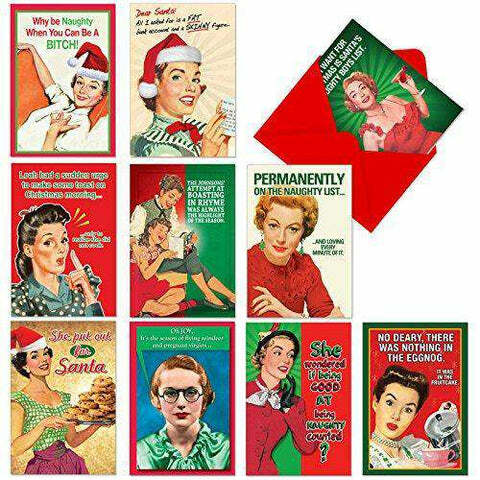 10 FUNNY NOTE CARDS - Each card has a unique inside greeting (review photos), but all wish a very Merry Christmas & Happy New Year from a sassy, confident woman! 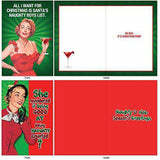 At just under the size of a standard 5x7 card (4-5/8 x 6.625 Inch), our humorous, classic photos capture the holiday spirit & will surely get your friends & family laughing & smiling! Each design has its own clever quote or caption about drinking too much eggnog, cooking, being on Santa's naughty list, and more! 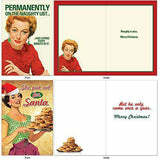 CHRISTMAS CARDS WITH ENVELOPES - Just smaller than the standard 5x7 greeting card (4-5/8" x 6.625"), our assortment comes with their own red envelopes. This bulk box of ten cards is easy to store at home or at work, ensuring you never run short of having just the right Christmas message for any occasion! NobleWorks carries a wide assortment of designs and art styles, offering a unique match for men and women looking for the right notecard for their special, personal message. THE FUNNIEST GREETINGS - If you're looking to humor your family members, best friend, girlfriend, or business coworkers, then our witty holiday cards will become the talk of the party! With plenty of writing space to personalize each card, you can easily write your own inside jokes or simply let the card do the talking! 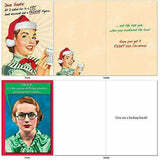 However far your sense of humor takes you, stock up and save on this unique variety of 10 boxed note cards for extra special Christmas cheer!